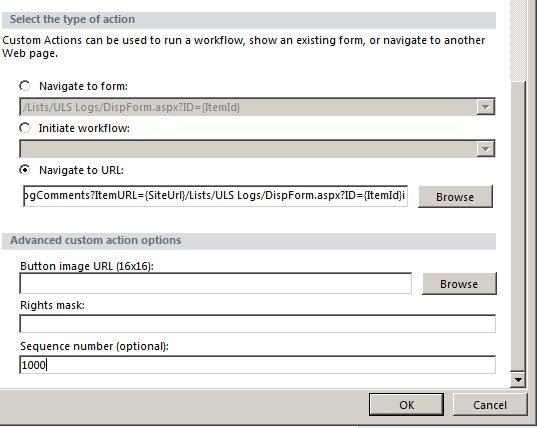 In SharePoint 2010, it is easier than ever to add custom actions that are scoped to a specific list using SharePoint Designer 2010. So today, I am going to walk you through the process. 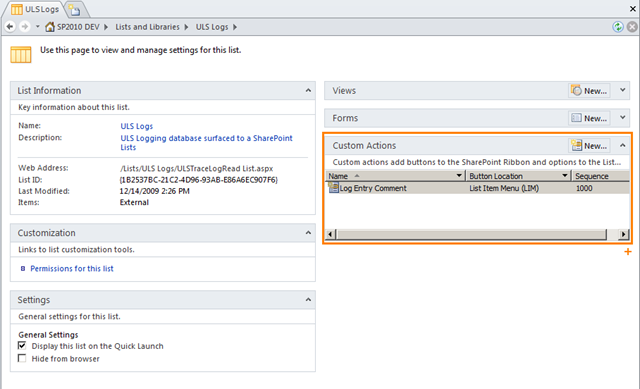 In a prior post, I showed you how to surface ULS logs using SharePoint Designer 2010, an External Content Type, and an External List. We’re going to use that list as our base for our custom action. 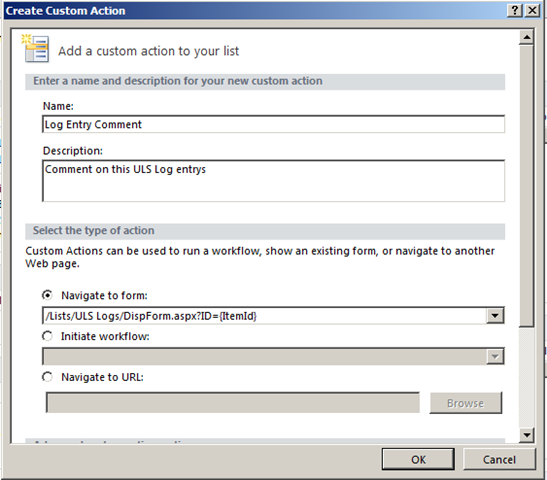 Our phony business case for this custom action is such – We are surfacing our ULS logs into a SharePoint list, and want to collect feedback on specific log entries for later consumption. We need to link to a form elsewhere in the site, which we will pass a reference to the item in question, as a URL. Note – the List Item Menu refers to the same thing as the Edit Control Block. 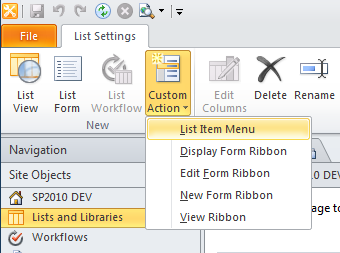 This is the context menu which is associated with all list items, available in list views and list view web parts. OH NO!!!! We can’t use it in Beta 2, which is the public beta we are running! Ok, so I guess on the receiving end, we’ll need to fix it up in some other way. 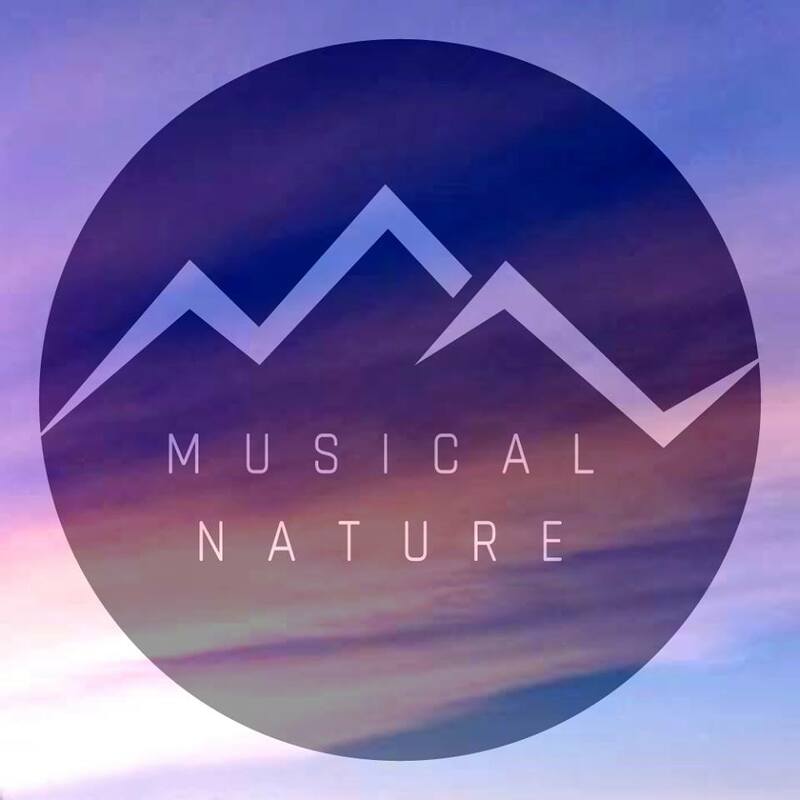 So., we’ll just change our URL to pass a few things, and build the URL ourselves. So, set your URL, and then give it a sequence number. This is the number in which it appears in the list. Anything over 10000 is a good practice, so you do not interfere with any other items in the list. Then click OK, and you now have a custom action, associated with a list item, all without cracking open Visual Studio, deploying a package, etc. etc. So, let’s go check out list… and there we have it, our custom action, associated to the list item menu/edit control block, within our list! Another cool thing, which you may notice, is that ALL list items have a globally unique identifier in SharePoint 2010! YES! No more list item IDs starting with 1, and going up from there. Good post. One question though, how do you any other pass parameter other than the id itself say in this example, processname, etc ? SharePoint cannot pass any additional information relating to the list item. To do this, you would need to go with custom code. Is it possible to implement the same thing in sharepoint designer 2007? Unfortunately, it is not. This functionality is only available in SharePoint Designer 2010. One thing I think is a fail is that the custom action’s description does not appear as a tooltip when the user hovers over the button. Any ideas on enabling this? Oh and also- can you clarify exactly what occurs when a user clicks on yuor newly-created action button? what form opens, and where are the comments saved?